Today’s global markets and rapidly evolving technology have made it possible for companies to compete and expand to all corners of the globe. To be successful in this dynamic business environment, however, companies of all sizes, especially in the manufacturing industry, face ongoing challenges. To help them overcome these challenges, they are adopting Cloud ERP solutions like Rootstock Software in increasing numbers. Why are More Companies Turning to Cloud ERP? Social media functionality to improve collaboration with customers, employees, suppliers and partners. The ability to integrate with their other systems and applications. According to a recent study conducted by Techaisle, a global SMB IT Market Research and Industry Analyst firm, cloud computing, social media, mobility and collaboration are the four highest priorities for small and medium-sized businesses in 2015. The same survey also found that SMBs listed increased profitability, business growth, reduced operational costs and the attraction and retention of new customers as their top business issues. The Techaisle study echoes another survey published in 2014 by KPMG, illustrated below. Additionally, many firms, especially large manufacturers, have invested millions in on-premise ERP systems. But these legacy systems are holding companies back due to their high operating costs, need for expensive upgrades and customization, outdated hardware, limited capabilities and limited access to data. Both groups, SMBs and large manufacturers, are turning to cloud ERP solutions. Either they are are adopting 100% cloud ERP solutions or they are turning to hybrid, or two-tier, cloud ERP solutions, which allow them to augment their on-premise ERP systems with cloud-based functionality. Cloud ERP brings many advantages to manufacturing firms, including increased data storage, real-time data access, scalability, and reduced costs. Cloud ERP lets firms access big data in the cloud on any device from anywhere in the world in real time, and then make critical business decisions on the fly collaboratively. This leads to greater efficiencies, greater productivity, and dramatic increases in the ability to react swiftly to changing customer demands and greater profits. The numbers don’t lie - cloud ERP adoption rates are increasing. For example, Gartner’s study, “Survey Analysis: Adoption of Cloud ERP, 2013 through 2023,” predicted that cloud-based manufacturing and distribution software will increase from 22% in 2013 to 45% by 2023. Gartner predicts that most of this growth will be driven by the adoption of hybrid ERP systems. Gartner’s study included companies from EMEA, APAC and Latin America ranging in size from $10M to $10B. They also found that a total of 47% of organizations surveyed plan to move their core ERP systems to the cloud within five years. Another study completed in 2013 by MintJutras, a leading research and advisory firm tracking ERP trends, found that SaaS-based manufacturing and distribution software will increase from 22% in 2013 to 45% by 2023. SaaS-based applications will steadily grow from 22% of all manufacturing and distribution software installed to 45% within ten years. The catalyst for much for this growth will be two-tier ERP system adoption. 78% of American small businesses will have fully adopted cloud computing by 2020, more than twice the current 37%. Hybrid cloud is now being used by 18% of small businesses already using the cloud (1-99 employees). A study reported in Odin SMB Cloud Insights 2015 expected that the European SMB Cloud Service market will grow from 18.9B euros in 2015 to 30.1B euros in 2018, reaching a compound annual growth rate (CAGR) of 17%. 62% of business application sales are closed after a free trial offer, according to the study. 59% of SMBs using cloud services are reporting significant productivity benefits from information technology compared to just 30% of SMBs not yet using the cloud. 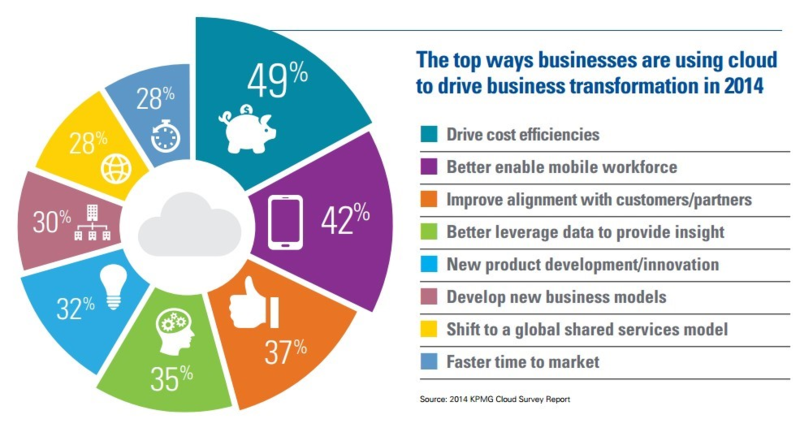 82% of companies have saved on costs by implementing cloud technology in their business. IDC found that 81% of US companies with 100+ employees are currently using cloud-based software. 37% of US small businesses have deployed cloud solutions and over 28% plan to use cloud. Worldwide adoption rates are also strong. India leads the pack with 32% growth in cloud adoption rates, followed by Brazil (29%), China (22%), and the United Kingdom (18%. 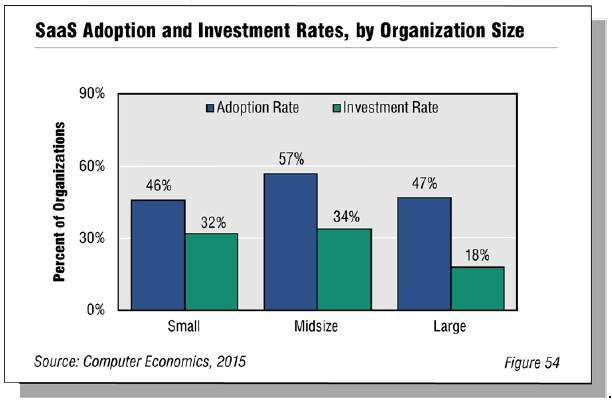 In “Technology Trends 2015: Adoption and Economic Experiences for 14 New and Popular Technologies,” Computer Economics reported that SaaS (Software-as-a-Service) cloud adoption rates were high across companies of all sizes, but that actual investment differed, with large enterprises investing less in SaaS-based solutions, which can be seen in the following chart. But what about those legacy ERP systems? According to Gartner, we are now firmly in the era of postmodern ERP. In their recent analysis of ERP, “Postmodern ERP Strategy Is Key to Success With ERP Initiatives,” Gartner talked about postmodern ERP as the next step in the evolution of ERP software. According to Gartner, as large on-premise ERP systems quickly become obsolete, companies are looking for a decentralized, hybrid system of mixed vendors, mixed functionality and in some cases, an even split of on-site and online systems. Gartner believes that businesses can take advantage of the lower costs, better functionality and increased flexibility provided by mixing cloud applications with on-premise applications. Regardless of how they get there, manufacturing firms of all sizes are moving to adopt cloud-based ERP to help their businesses. Rootstock Software is one cloud ERP vendor that is already helping manufacturers and distributors adopt cloud-based solutions. Rootstock, designed by manufacturing industry experts, is a 100% Salesforce native solution that represents every step in the manufacturing process and helps companies become more efficient, control costs and increase revenue. Rootstock cloud ERP for manufacturing lets firms manage their manufacturing, distribution and supply chain operations in real time, anytime and anywhere. Manufacturers and distributors are able to access a single system for multiple sites and outsourced services while maintaining visibility across their global operations. Rootstock software includes modules for sales order management, purchase order management, production engineering, inventory management, material requirements planning, lot and serial control, scheduling and capacity planning, and shop floor control. Because it is 100% native to Salesforce, the leading enterprise cloud platform, Rootstock software can integrate with other Salesforce apps out of the box, and can be customized using Salesforce’s Apex Code programming language. Manufacturers and distributors looking to adopt cloud ERP solutions can count on Rootstock Software.